I am often asked whether marking the position of a ball on a putting green with the toe of a putter head is permitted by the Rules. Personally, I wish that it wasn’t, as in my opinion it is an unsatisfactory, lazy practice that should be discouraged, especially in competitive golf, but this part of Decision 20-1/16, clarifies that it does not incur a penalty. Q. The Note to Rule 20-1 provides that "the position of a ball to be lifted should be marked by placing a ball-marker, a small coin or other similar object immediately behind the ball." Is a player penalized if he uses an object that is not similar to a ball-marker or small coin to mark the position of his ball? A. No. The provision in the Note to Rule 20-1 is a recommendation of best practice, but there is no penalty for failing to act in accordance with the Note. scratching a line, provided the putting green is not tested (Rule 16-1d) and a line of putt is not indicated (Rule 8-2b). As this practice may cause damage to the putting green, it is discouraged. However, under Rule 20-1 it is necessary to physically mark the position of the ball. Reference to an existing mark on the ground does not constitute marking the position of a ball. 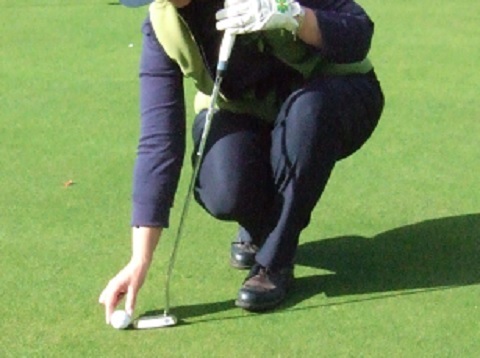 For example, it is not permissible to mark the position with reference to a blemish on the putting green. Prior to the recommended Local Rule relating to the accidental movement of a ball, or ball-marker, on the putting green being adopted by Committees at the beginning of 2017 (see this blog), there was always a chance that the player could be penalised if they then lifted their club from the putting surface, e.g. while cleaning their ball, but that does not now apply, providing the action was accidental. The Committee must announce the manner, day and time for the decision of a halved match or of a tie, whether played on level terms or under handicap. This is a subject that is often ignored by Committees, until they are forced to address a situation that has arisen when two or more players finish a stroke play competition with the same scores. (c) If a play-off of any type is not feasible, matching score cards is recommended. The method of matching cards should be announced in advance and should also provide what will happen if this procedure does not produce a winner. An acceptable method of matching cards is to determine the winner on the basis of the best score for the last nine holes. If the tying players have the same score for the last nine, determine the winner on the basis of the last six holes, last three holes and finally the 18th hole. If this method is used in a competition with a multiple tee start, it is recommended that the “last nine holes, last six holes, etc.” is considered to be holes 10-18, 13-18, etc. In my experience this is the most widely used condition of competition relating to ties in Club and Society competitions and is easy to administer. To sign up for my current "Rhodes Rules School" free, weekly email series, 'Pros Getting it Wrong!' click here. To purchase the full set of 99 issues of 'Pros Getting it Wrong!' click here.